Scientists from the Univ. of Southampton have developed a new technique to generate more powerful, more energy-efficient and low-cost pulsed lasers. 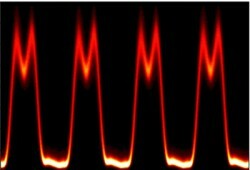 Any application that requires optical pulses typically needs waveforms of a specific repetition rate, pulse duration and pulse shape. It is often challenging to design and manufacture a laser with these parameters exactly as required. Even when a suitable solution exists, the size, the complexity and ease of operation of the laser are further critical considerations. David Wu, lead author of the study and winner of the 2014 Engineering and Physical Sciences Research Council (EPSRC) ICT Pioneers award for this work, said, “As our new technique is based on a different approach to that currently used, it has several distinct features that are relevant in many applications. First, it is easily scalable—by combining a larger number of input lasers, shorter or more complicated-shape pulses and/or more power can be obtained. It can also generate pulses with a very low-level of noise (down to the quantum limit) and very high (greater than one THz) repetition frequencies.